Hello and welcome to the Arful INKables blog hop! Hopefully you made it to my blog by way of Toni, but if not start at the beginning and make your way back : ) All of the INK girls are showing samples made with FOUR new sets that are available NOW! My first sample is from the set Berry Picking. Isn't she the CUTEST!?! 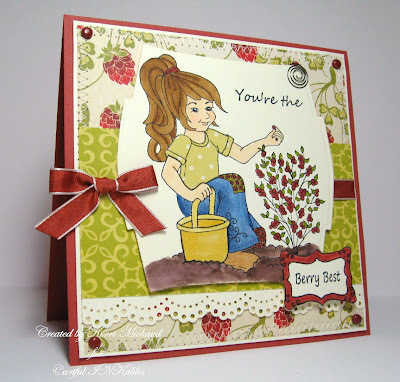 I love how I have her picking rasperries, but as you continue on through the blog hop, you'll see that others used a blueberry theme. This is a set of 6 and comes with this stamp I used, a sprig of blueberries, as well as 4 adorable sentiments to choose from! My second sample is from the set Birthday Best. I LOVE IT! There are 10 stamps in this set and included is this awesome large present that I chose to paper piece. You will also find an adorable 3 tiered cake, 2 sizes of cupcakes, and 6 sentiments to choose from! Thank you for stopping by! Now hop on over to Elena's blog, but don't stop there because you may find a treat at the end! love the raspberries! and your pieced present!! Love your card, Kerri! Your gift box is so cute! Love the paper piecing! And little girl picking the berries is so precious! I love the layout of the card and DP!!! WOW, Kerri, Im loving that paper peiced present...the whole card is so festive! And you already know how much I love the berry girl card! Great job! these are fantastic, love them both! Wonderful cards. Very bright and cheery. Love them both. Kerri, both of your cards are absolutely fabulous! 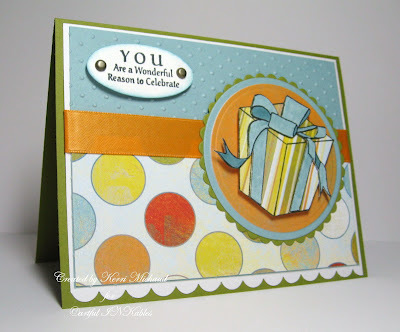 I love how bright and cheerful your designs are and your coloring totally rocks! Oh my gosh, these photos are just precious and such memories to keep!!! Both cards are just wonderful! The first one is beautiful and the second one is just very fun and pretty too!